Last night was McDonald’s Night for Tater’s School ~ the school gets a little bit of money for every Happy Meal purchased between 5 pm and 8 pm and all the teachers are there to chat, and make you feel good about your McDonald’s meal. Remember, it’s a very small school, so this is do-able. As I talked to other parents and friends, I noticed only kids were eating (and us…cause we don’t know ‘THE RULES”). There were Happy Meals all around, but I only saw a stray cheeseburger or fish filet wrapper crumpled up, tucked under the napkins, discarded like the embarrassing uncle you don’t tell anyone about. Boy, do I have a Marketing-Fund Raising Plan for them! Now ya’ll know I’m a fan of Mickey D’s and have eaten there at least once or a hundred times, so this isn’t a fast food/McDonalds/poor-food-choice bashing…..no, this is economics, pure and simple. 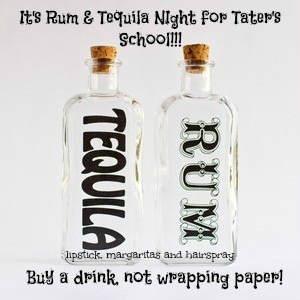 They need to have a Rum and Tequila Night for the School!! Next Sasha’s Shop is OPEN!